Vision: Using technology to inspire our students to become 21st century learners. Students will work collaboratively on authentic problems which enhance communication, creativity, critical thinking, and problem solving. Through personalized, authentic and collaborative experiences, our students will develop the skills to prepare them for the future. 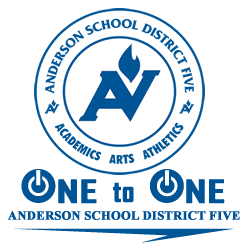 Anderson School District Five will use this site to share information about our 1:1 initiatives and projects. In September of 2012 Robert Anderson College and Career Academy approached the district with an idea to use their school funding to pilot a one to one program. Approval was given by the Superintendent to explore the idea further and device testing was begun. After a short time it was decided that Google Chromebooks offered the best balance between cost an functionality for the middle school students. A project cost evaluation was completed, outlining the plan to acquire and pay for the devices, and this too received a green light from the Superintendent. Shortly after the Chromebooks were ordered and extensive Professional Development was planned. In the fall of 2013 Chromebooks were distributed to students for use at school only. By October of 2013 devices began going home with students and this continued to be implemented one grade level at a time. This continued throughout the school year until devices began transitioning back to school around May of 2014. Once all devices were collected and the year came to an end the school began processing the devices to determine if any repairs were required in preparation for assignment again the next school year. It is our hope that the continuation of this PROVEN pilot with be as successful as we work to expand the program to other schools and grade levels across Anderson School District Five.